Pricing and monitoring financial performance are crucial to business success. This presentation covers the elements of budgeting and business planning. The methodology will help the participants develop personal criteria for accepting or rejecting freelance assignments, balancing employment offers and choosing alternatives for business expansion. The presentation will cover calculating the break-even price, and tracking sales volume and revenue. This is not a number-crunching presentation; come prepared to enjoy learning how to set your business on a solid financial footing and keep it there. 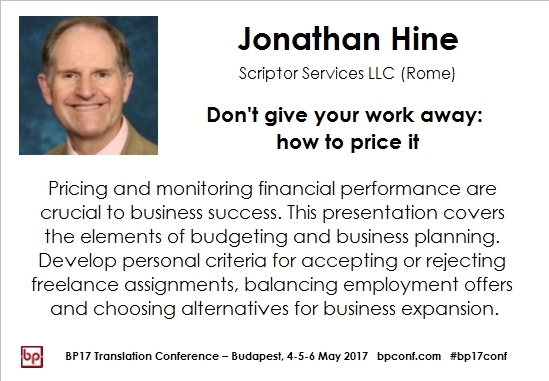 Jonathan Hine, CT (I>E) has been conducting freelance business workshops for more than 20 years. In addition to translating and revising, he writes self-help books and articles for freelancers, and a blog about working while traveling. He translated his first book, a medical text, in 1962. A graduate of the U.S. Naval Academy (B.Sc. ), the University of Oklahoma (MPA) and the University of Virginia (Ph.D.), he belongs to the American Translators Association (ATA), the National Capital Area Chapter of ATA, and the American Translation and Interpreting Studies Association (ATISA). He also volunteers as an ATA mentor and a Certification Exam grader. This double session (2 x 50′) is scheduled for Saturday, 6 May, 2017. You can attend this session by purchasing a 2-day pass to BP17, covering both Friday and Saturday.